Following the amazing success of Candide, Artistic Director Philip Brunelle was in Mexico City for meetings about the Ensemble Singers next visit there in August 2019. He and his wife Carolyn also spent four days vacationing in Oaxaca (a rarity!). On Sunday, April 7 he will accompany the five Plymouth Church soloists in a concert as part of the celebration of his 50th anniversary at Plymouth. On April 13 he conducts the National Anthem with members of the Ensemble Singers and a brass quintet from the Minnesota Orchestra at the opening game of the professional soccer club Minnesota United FC in their new stadium in St. Paul. This is part of a continuing collaboration between VocalEssence and Minnesota United FC. Of course, April begins the time for auditions, an important aspect of VocalEssence as we reach out to the community and also continue our high standard of singing. Rehearsals for our The Times They Are A-Changin’ concert continue, preparing for the April 27 event at the Palace Theater in St. Paul. Associate Conductor G. Phillip Shoultz, III finished his run as Governor in Candide and completed a successful inaugural Tales and Tunes concert last Saturday. He is currently completing school visits as part of the Classical Minnesota Public Radio/VocalEssence Choral Residency program. Over the past three weeks, Phillip has visited schools in Detroit Lakes, St. Cloud, New Brighton, and throughout the Twin Cities. During that time, he worked with over 875 students in numerous choral classes! Upcoming visits to Faribault, Robbinsdale, and beyond are being finalized for April and May. Phillip was also the guest conductor for the 45th Annual All-City Choirs in Detroit Lakes, where he spent two days in residence with 8 choirs, culminating in a final performance. Phillip and the VocalEssence Singers Of This Age have been working hard this month preparing for the world premiere of the chamber opera, Tienda, a collaboration with the Schubert Club and our annual VocalEssence ¡Cantaré! Community Concert at The Ordway. 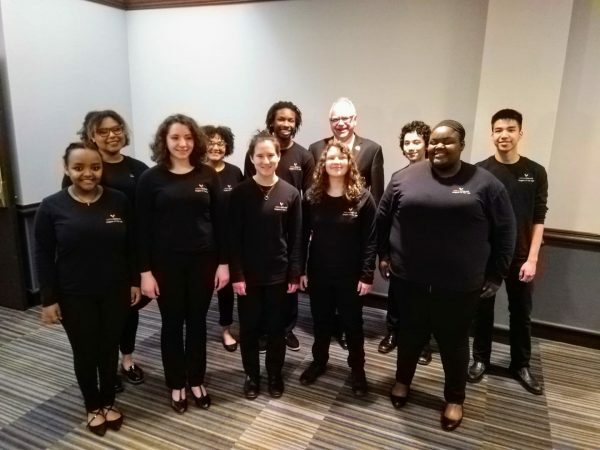 They performed for Governor Walz at the Nellie Stone Scholarship Gala a few weeks ago, and Governor Walz was so moved by the performance that he specifically invited VocalEssence Singers Of This Age to sing at the Capitol in the upcoming session! April brings a day tour for the VocalEssence Singers Of This Age including a performance for the Schubert Club’s Noon Courthouse Concerts and a trip to Northfield to visit the campuses of Carleton College and St. Olaf College. Finally, in addition to preparing for our upcoming The Times They Are A-Changin’ and Soul Sing concerts, Phillip is enjoying conversations with numerous collaborators as he finalizes some plans for the 19-20 season. Stay tuned for exciting travel plans for our VocalEssence Singers Of This Age singers!